My name is Hugo Bottino, I’m 19 years old and from France. Firstly, I would like to say thank you to Aerodyn Ltd for the opportunity that they have given me. I’m currently in my second year of a Bachelor’s Degree at Kedge Business School in France. This degree is ranked #1 as you can see in a recent study published in “Le Parisien” dated March 2017. Whilst in High School I discovered I have a passion for Economics, because of this I chose to study at a business school. I am an active member of one of my school’s student organisations, within which I deal with the digital age and IT. I am the Community Manager in this organisation where I manage social networks. We also organise the Digital Day each year, inviting some key companies on to our campus (IBM, French Tech, etc.). I am a hard worker, competitive and determined to reach my objectives. I’m also very open-minded and love travelling. When not at work, I like to play sports like competitive tennis and football. For the second year of my bachelor’s degree, I have to do an internship abroad during the second semester. I chose Aerodyn because the tasks are varied and touch many different fields. 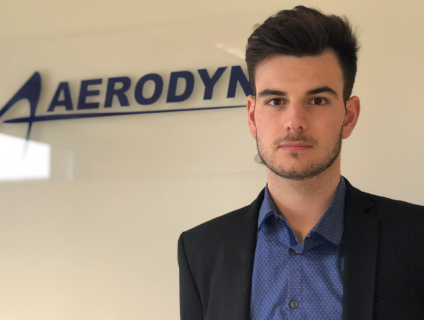 I don’t have a clear idea on what I want to do after university so doing an internship at Aerodyn may help give me a clearer understanding. During this internship, I aim to apply my skills gained during my studies, I also hope to be helpful for Aerodyn during this 5 months. I’m really grateful for the help that Aerodyn has given me to feel good in this country and within the company. All my new colleagues seem nice. I hope I will have an interesting 5 months within Business administration team at Aerodyn Ltd in Derby, UK.